Aloe vera is among the world's most used natural plants, with a market worth an estimated $13 billion a year. It is also one of the oldest. Historical documents make mention of aloe vera as medication circa 65 AD, when it had been used to treat soldiers wounds and bleeding. Working together, researchers from London's Royal Botanic Gardens at Kew, the Natural History Museum of Denmark in Copenhagen, and botanists in Africa and Europe have actually examined the DNA of close to 200 aloe species to build a Map of how they are related and where they originated. Today, aloe vera is the only aloe species which is not at risk of extinction, simply because it is so widely cultivated. The Use of aloe vera gel, which is found inside the leaves, surged right after, first as a skin salve for burned and damaged skin and later as a treatment for cancer and eczema. As for why aloe vera became so popular whilst other species have dwindled, Nina Rnsted, a professional in the evolution of medical Plants in the Natural History Museum of Denmark in Copenhagen, suggested to New Scientist: A few of the earliest uses of aloe vera involved the use of its sap, which differs from the gel. In India, people have dabbed it on sore eyes and inflamed joints for hundreds of years. 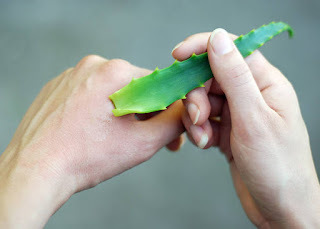 Long before this the Chinese used aloe vera gel to clear dermatitis. The Japanese slathered chopped gel on burns and drank it mixed with rosewater as a treatment for tuberculosis and gonorrhea. Fresh leaves of aloe contain different groups of chemical compounds such as: glycoproteins, polysaccharides, anthraquinone derivatives, vitamins, minerals, amino acids, and many others, which show a multi-directional therapeutic action. Fresh aloe vera gel is rich in enzymes and has anti-bacterial, anti fungal, and anti viral properties. Aloe vera juice can be useful for acid reflux, for instance, but ideally should be made from homegrown aloe with leaves which are 18 inches long before harvesting.